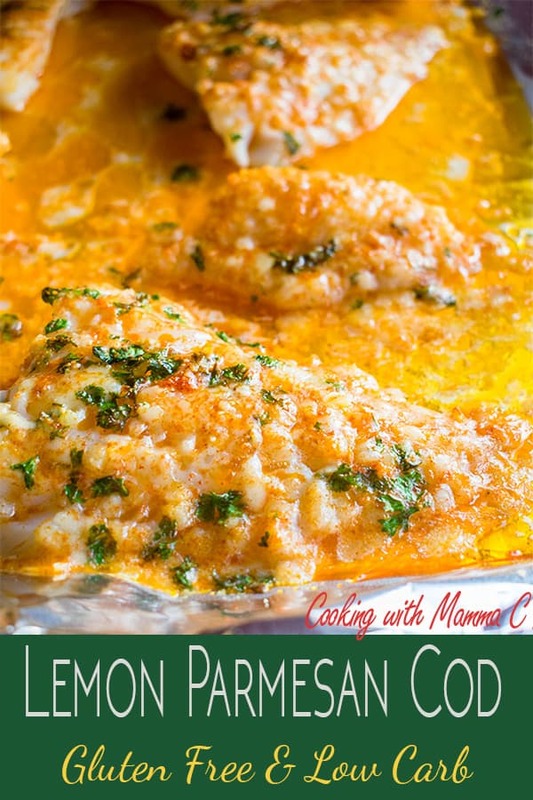 Baked Cod with Parmesan and Garlic Butter is the most popular dish on Cooking with Mamma C and one of the best cod recipes! It’s even loved by toddlers and people who don’t like fish! Gluten free, low carb and keto. But this Baked Cod with Parmesan and Garlic Butter blew me away and became an instant family favorite. And, it quickly became the most popular recipe on Cooking with Mamma C, garnering fans from around the world. I was completely unaware that baccalà had an alter ego — the moist, mild-tasting, sturdy, so-good-it-could-pass-for-a-poor-man’s-lobster fresh cod. So, I didn’t eat cod for two whole decades. Yes, folks, I missed out on what has now become my favorite variety of fish. I’m so glad I eventually let a fish clerk talk me into making cod back in 2014. That’s when I took my beloved Parmesan Chicken Drumsticks with Garlic Butter recipe and turned it into a baked cod dish. 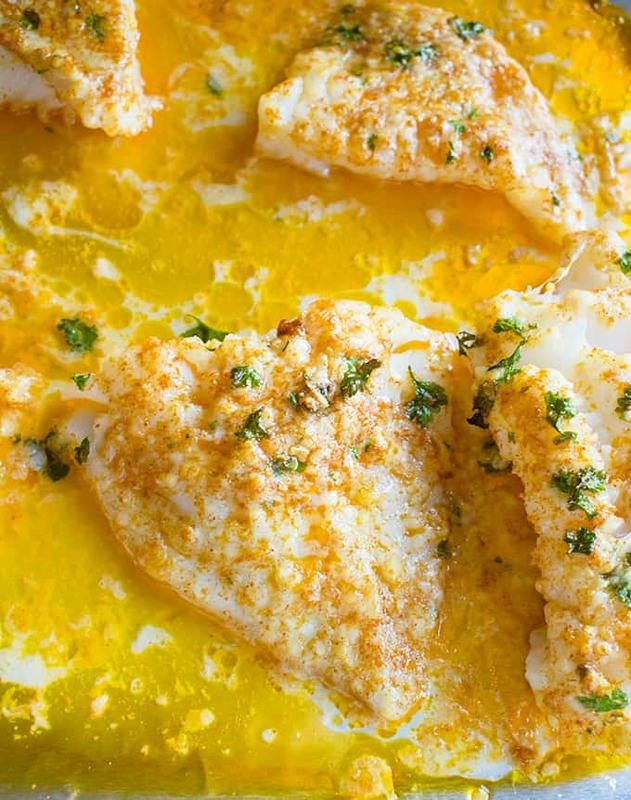 A gluten-free, low-carb, keto-friendly cod recipe that even picky eaters love. 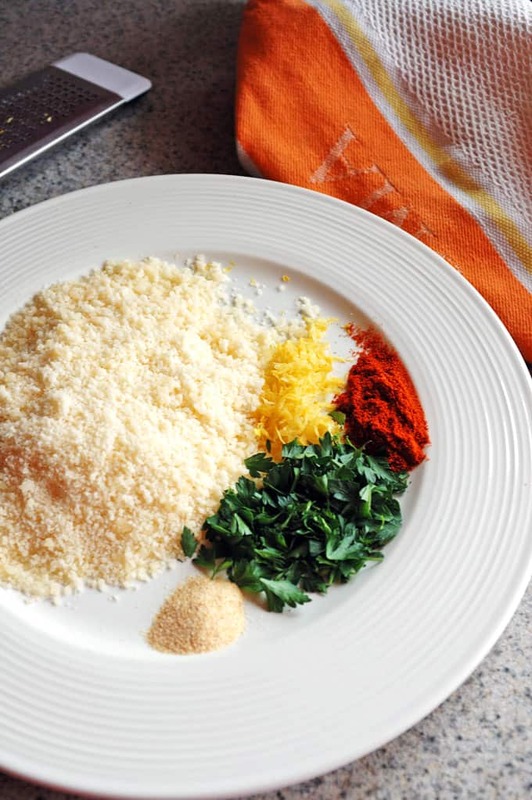 Mix freshly grated Parmesan with garlic powder and paprika. Add lemon zest and chopped parsley to the mixture. I use this zester (affiliate link). Dip the cod in melted butter, then dredge it in the cheese mixture, pressing it onto the fish. Drizzle any extra butter over the fish. Bake the cod at 400 degrees F for 15 minutes. 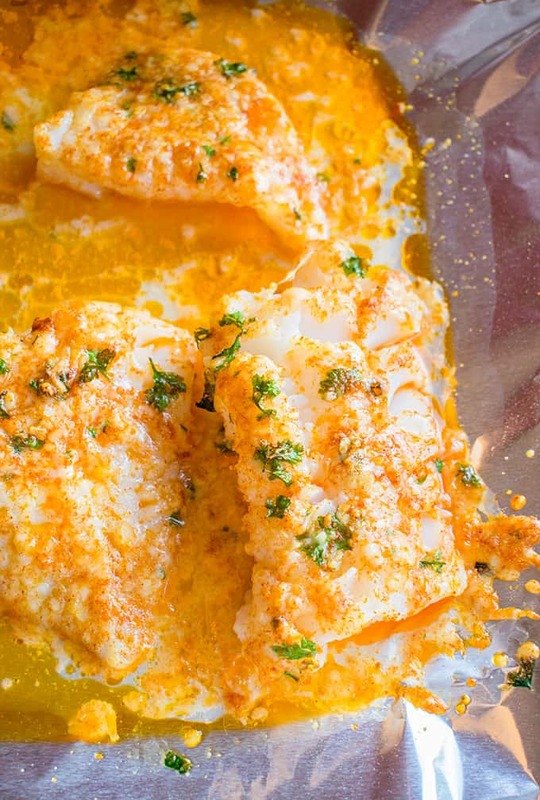 Squeeze lemon juice over the baked cod. The Parmesan-crusted cod comes out of the oven in a nice pool of garlic butter begging for bread to be dipped in it. 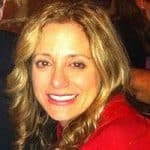 If carbs and gluten aren’t issues for you, go for it! Now, since there are so many comments on this post, I’ll share my answers to some of the most common questions about this cod recipe. Can I Prep this in Advance for Company? Sure! Earlier on the day you want to serve it, dip the cod fish in the melted butter and coat it with the Parmesan mixture. Then, refrigerate it in a single layer, covered lightly with foil instead of plastic wrap, which would stick to the coating. 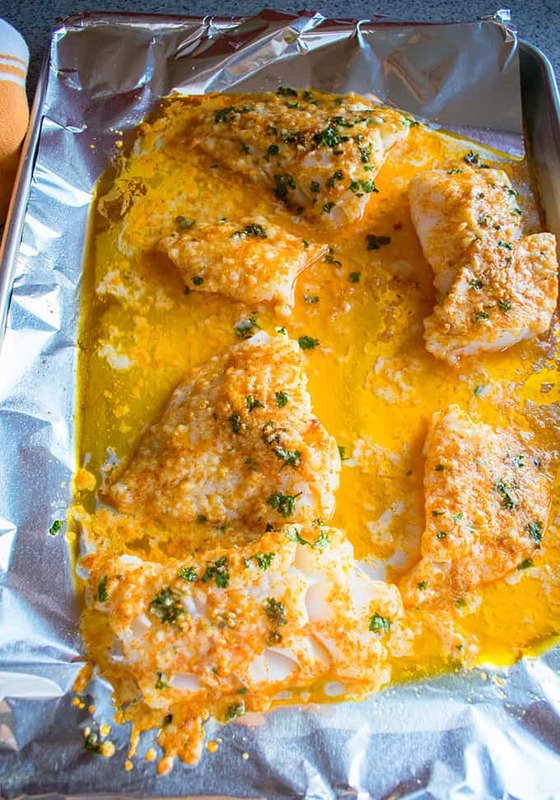 Remove the pan(s) of fish from the fridge 15 minutes before the cod needs to go in the oven. You might need to bake the cod slightly longer than 15 minutes if your pans are chilled, so just cut into one of the thicker pieces to see if it’s ready. Can I Use Frozen Cod in this Recipe? For best results, use fresh cod, but you can use frozen cod if you thaw it first. Make sure to pat the cod dry with paper towels. Can I Use Fresh Garlic? Yes, several readers have substituted a chopped garlic clove for the garlic powder with great results. What Can I Substitute for Fresh Parsley? Try a teaspoon of dried parsley or dried basil. Yes, use what you have. Next time, you can try it with the lemon zest and fresh lemon juice. What If I Don’t Have Paprika? Skip the paprika and then, after the fish is cooked, see if it needs extra black pepper or even a bit of red pepper. Can I Make this with Haddock? Yes. Haddock can be used as a substitute for cod. Shrimp tastes delicious with these ingredients. Here is the recipe for Baked Parmesan Shrimp with Garlic Butter. If you want to keep this meal gluten free, try it with rice and asparagus. Amish Brown Butter Mashed Potatoes also would be a great side dish. If you love cod as much as I do, be sure to check out my Baked Cod with Coffee Butter. And, don’t miss my Nonna’s Sautéed Cod with Tomatoes! Here are 23 cod recipes you might enjoy too. Mine is the last one in the article! 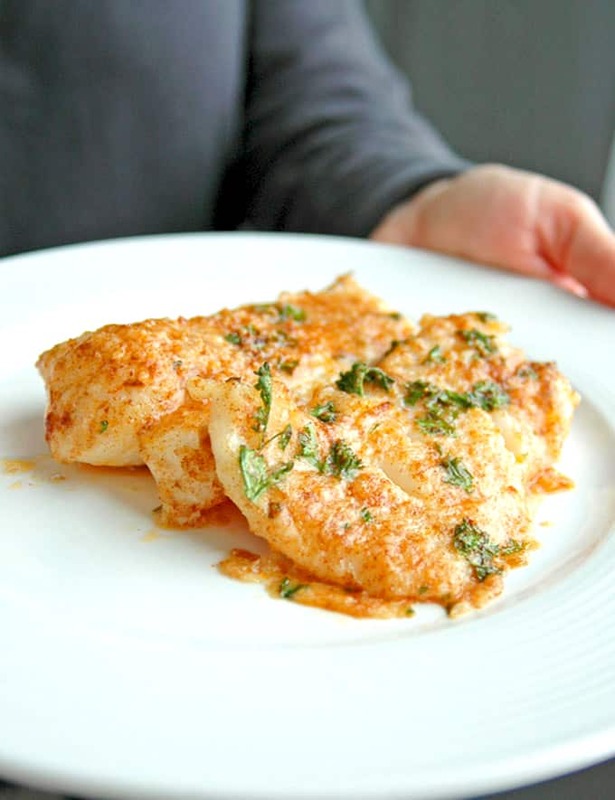 Watch the video to see how to make Baked Cod with Parmesan and Garlic Butter! Baked Cod with Parmesan and Garlic Butter is sure to become a favorite meal and is fit for company! Serve with bread to dip into the luscious garlic butter. Preheat the oven to 400 degrees F. Grease a rimmed baking sheet with cooking spray. Place the grated Parmesan on a dinner plate and add the garlic powder and paprika. Wash the lemon and pat it dry. Cut it in half and make zest from one of the halves by using a zester or grater to shave off the yellow part of the skin, adding it to the cheese mixture. Rinse the parsley and pat it dry. Cut it with scissors or chop it before adding it to the cheese mixture. Toss the cheese mixture with a fork to blend it. Rinse the fish in cold water and rub your thumbs along the surface to see if there are any bones to remove. Pat the fish dry with paper towels. Melt the butter in a small pan on the stove or microwave it in a bowl. Set up an assembly line from left to right with the fish, the butter, the cheese mixture, and the sheet pan. 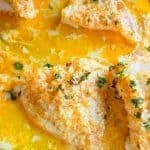 Use a fork to dip each piece of fish in the butter on both sides, then in the cheese mixture, coating both sides and patting the topping onto the cod with the fork. 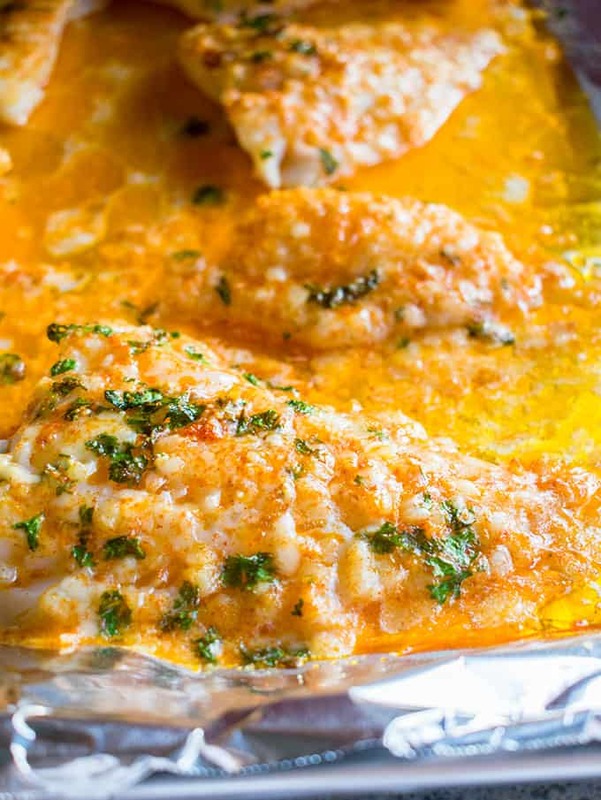 Place the coated fish onto the sheet pan, top with any excess melted butter and bake for 15 minutes. The cod is done when it can be easily flaked with a fork. 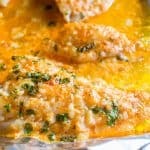 Squeeze lemon juice over the fish and serve with bread for dipping in the garlic butter (you can place the pan on the table for informal dinners) or spoon the butter over rice, mashed potatoes or polenta. Store leftover cod in the refrigerator for up to three days. Wow that is such a good recipe. Our first time cooking fresh cod and it was delicious. Will be my go to recipe from now on for cod ect. Thank you!!. 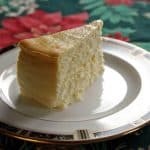 Hi Shirley – This is my go-to recipe as well! I’m glad you enjoyed it and hope you’ll explore some of my other recipes. Andrea, it looks perfect and tasty! Can’t wait to have this anytime of the day, love it! Hi Olga – It’s one of our favorites. Enjoy! Do you add the butter to the fish pan before baking ? Hi Philip – Yes, after dipping the fish in the butter and dredging it in the cheese mixture, pour any excess melted butter over the fish before baking. I’ve updated the instructions to include that info. Enjoy! Fantastic recipe. I will be using this again. Only change I made was I use smoked paprika. Hi Jason – Smoked paprika is perfect! I’m happy you loved this cod recipe. Thanks for letting me know! We’re doing more of a Mediterranean meal plan so do you think I could substitute olive oil for the butter? Hi Kristen – It’s tastier with the butter, but you can use olive oil, if you prefer. You’ll need to add a little salt to compensate. I tried this recipie on shrimp, added some different Cajun seasoning to the mix and it was REALLY GOOD! Didn’t really too much like cod but the recipie itself was a HIT ! My fiancé enjoyed it as well over rice and with asparagus. Hi Latesha – We love this with shrimp too! Here is my recipe for Baked Parmesan Shrimp with Garlic Butter. Cajun seasoning would be delicious. Thanks for letting me know! This dish was very simple and delicious…after some added salt! I originally thought that the Parmesan would be salty enough, but after spritzing with lemon juice, it was still lacking. Added a dash of salt over the top and that completely transformed this dish! Cod is a very bland fish and needs to be seasoned. I will be making this again, but will probably salt the fish beforehand. Hi RaeAnne – Always salt to your taste. When I use salted butter in this dish, I find that’s enough salt for me, with the Parmesan. Last night though, I made this with hake instead of cod and used olive oil instead of salted butter…so I did add a little salt. I’m glad you enjoyed my cod recipe! This recipe is amazing! I made it with some older parmesan cheese in my fridge and it was amazing. My husband and teenage son absolutely loved it. I served it over white rice and spooned the sauce over it – absolutely delicious. Thank you! Hi Sarah – I love the idea of serving this with rice! I’m thrilled your family loved this cod recipe. Thanks for letting me know! 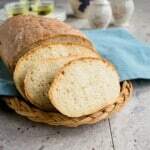 Hey there my husband is on low sodium diet what if I used either unsalted butter or olive oil and bread crumbs? Would that be ok? Hi Lisa – You could try unsalted butter and bread crumbs, then maybe add more seasoning, if needed. If you do want to use Panko bread crumbs. How much do you put? This recipe looks yummy. I want to try it in a couple of weeks. Hi Lisa – I haven’t tried it with panko crumbs. 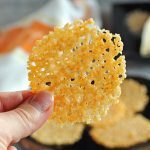 If you want to use a combination of Parmesan and panko, maybe try 1/2 cup of each, although you might have a little extra breading left that you could just sprinkle on top. Fantastic!! So glad to have have found this! Hi Kelly – I’m glad you found my cod recipe too! I hope you’ll try my other recipes as well. I made this tonight with green beans and lightly toasted bread for soaking up the butter, and OMG it was delicious!! Super easy, simple, and truly wonderful. Thanks for a great recipe! Hi Michelle – I love how you served it! I’m so glad you loved this. Thanks for letting me know! How did you cook the quinoa? Hi April – I didn’t make any quinoa with this.